Yet again, we were unsuccessful at trying to catch a leprechaun. According to Vance, there was a flaw in our design. The ruler that was propping the box up was too big. When the ruler fell, the box landed on top which left a space so that the leprechaun could slip out. This stage of the game will never get old for me. We have so much fun using our imaginations around here. I've been trying to make the most of everything since you never know when they'll grow up and stop believing. This week, wet footprints on concrete were made by leprechauns. When they disappeared the kids marveled in the magic of it all. If we were lucky enough to catch a leprechaun Vaughn wanted to name it Salam. I'm pretty sure she just shortened 'salami' to get that idea. She loves her cured meats. We baited our trap with one orange Tic Tac, one yellow sucker, and two marshmallows. The little man took the bait and left behind 2 green necklaces and 2 lucky pennies. I downloaded the lucky penny design from Pumpkin Petunia. It's adorable and such a good idea. Vance has been on break for 2 weeks now, so I haven't had any time away from my little buddy to shop for leprechaun gifts. I printed out the template on white paper then glued it onto green card stock. I shined the pennies (with ketchup! my MacGyver trick of the day!) and used just a drop of hot glue to adhere them onto the paper. 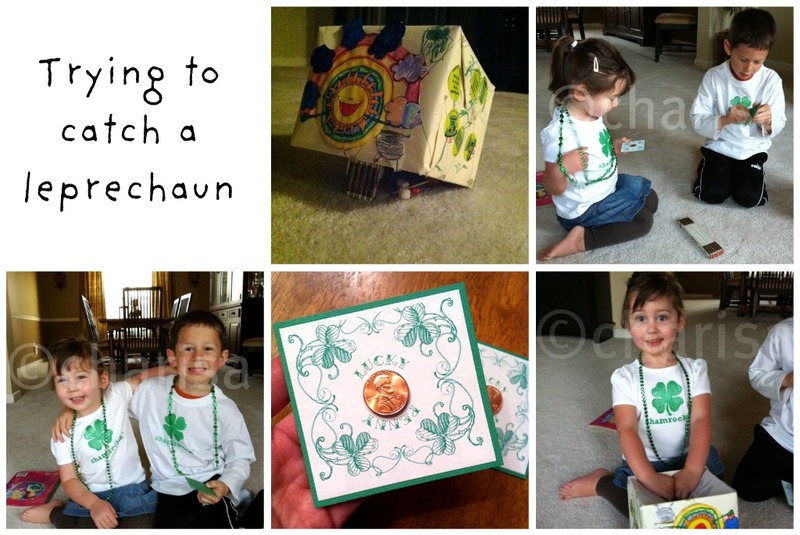 The necklaces were recycled from a stash of St. Patrick's Day stuff from last year's parade. The last picture of Vaughn up there is a little goofy, but it shows how cute her shirt came out. Hope you all had lucky days! Ketchup to shine pennies - didn't know you could do that! Cool! good blog, I'm gonna forward on to bill. He'll like it!